Let’s face it. We all can use a digital detox whether we admit it or not. In the age of constant tech evolution and a proliferation of social media apps, aside from habitually hitting snooze on the alarm clock, reaching for a smartphone upon sunrise has become a morning routine for most people. According to a new survey from ReportLinker, a tech analysis company, 46% of Americans admitted to checking their smartphones before they even get out of bed in morning and nearly 83% of millennials keep their phones on all day and night, not turning them off to go to bed. Wait, it gets worse. Not only have people's attention been instantly hijacked from checking emails or overnight notifications, but more than 10% of respondents said they play a game on their phone immediately after waking up. In a world of overstimulation from too much information, unsolicited opinions and an unsparing amount of negativity, your phone can rob you of not only your peace of mind but productivity. Here are some steps you can take if you’re looking to switch it up and not sabotage your day before walking out the door. Mindfulness and awareness of self is increasingly becoming a popular practice to alleviate stress. Sitting to clear your mind can be really difficult when just thinking about how to relax and telling yourself not to think is a thought in and of itself. A few minutes of breathing in silence can do wonders to calm any anxiety or tension you aren’t aware of. While meditation isn’t for everyone, there is scientific proof that meditating has been linked to less stress and more productivity. It’s something I do no matter the blissful or difficult day I know lies ahead of me. Each morning when I get out of bed, I verbalize three specific things that I’m thankful for. This alone gives me a more pragmatic mindset in preparation for whatever craziness or mishaps I’ll encounter living in New York City. So, whichever deity or Gods you worship, as a believer of any faith, gratitude for waking up another day can never be overstated. There’s no better way to get the blood flowing than starting your day with a nice stretch or a 15 minute low-cardio workout. So pull out that your yoga mat to loosen up a bit before you hit the streets. No, not news or the latest celebrity gossip from your social feed. Everything you may want to know about is either a scroll or click away but consider shopping around for a good leisurely read unrelated to the stuff you’re inundated with daily. There are ebooks and audiobooks out there too, but traditional books have not become obsolete so pick one up every once in awhile. 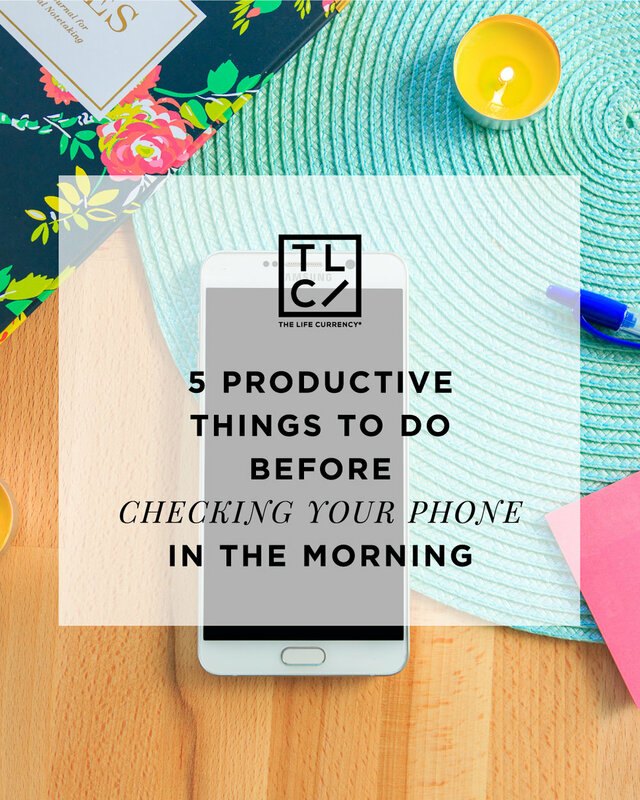 Honestly the best thing you can do to break the morning desire for your phone is to simply put it away. Go old-fashioned and invest in a $10 alarm clock for your wake-up call to avoid the innate act or temptation to reach for your phone right after you rise. It may seem tough at first given it is last thing you look at before calling it a night. But as with anything, self-discipline and repetition will eventually pay off.